20 years ago the architect bureau of Uldis Pīlēns concluded the first agreement on production of plastic windows, although the plant itself was not established yet. At present the Aile group, which is part of the holding, produces for export, creates new engineering solutions, and the production of mere plastic windows is left to yesterday. At that time plastic windows were a modern and demanded product, reflecting on 1994 says Dainis Bērziņš, the chairman of the board of Aile group. The first windows were made in the former premises of the military draft board in Liepāja, but the raw materials were stored in the nearby garage. Nowadays the head office of UPB nams is located here. As the number of orders grew, the window plant was relocated to Grobiņa. Currently, after 20 years, Aile group focusses mainly on large, complex glass facade solutions, and the three plants in Liepāja produce insulating glass windows, aluminium glazed facades, and wood and aluminium glazed constructions. Majority, around 80% of the production of Aile group is exported. "Export is managed in cooperation with our parent company UPB and its representation offices abroad. 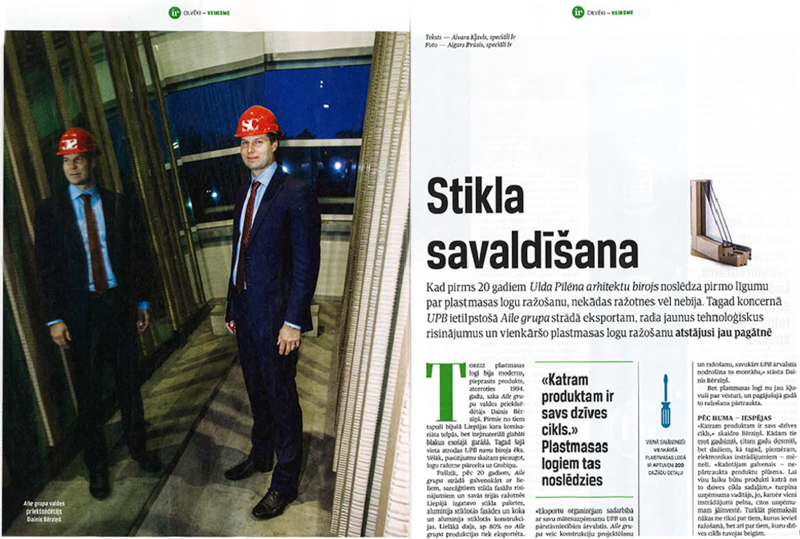 Aile group is responsible for the engineering and production of constructions, while UPB abroad is in charge of the assembly thereof," as reported by Dainis Bērziņš. However, the production of plastic windows is already history, and last year the production of these windows was discontinued. "Each product has its own life cycle," tells Bērziņš. For some these are centuries, or tens of years, while for others, such as the electronics products at present – these are months. "Most important to the producer is an uninterrupted flow of products. So that we have products at every section of their life cycle," the manager of the company continues his story; since while some products generate profit, other need investments. Moreover – extra funds are invested not only in the ones being introduced in production, but also in those approaching to the end of their life cycle. The idea of the whole UPB - constantly looking for new products and opportunities. Therefore the transfer from plastic windows, which were extremely demanded in the middle of the last decade, to glazed structures of higher value-added is absolutely logic. Windows are a long-term product, and as the construction boom came to the end, the demand for plastic windows suddenly stopped. Even with the municipalities investing in renovation of municipal building during the crisis could not support the former amount of sales. Even before the production of plastic windows was stopped the company Aile group shut down its retail network of windows in 2008 in Latvia. This overlapped with the time, when Dainis Bērziņš joined UPB. Bērziņš comes from Kuldīga, and has graduated from the Ventspils University College with a master degree in finance and economy. After graduation he worked for some time in the company Ventspils reiss, and later he devoted four years to the auditing company Ernst&Young. This was an extremely valuable experience, which allowed him in 2007 to get the position of finance director at UPB and slightly later – the chairman of the board at Aile group. This and especially the forthcoming years were definitely not the easiest ones for the company. In 2008 Aile legally became a single company group and moved completely from Grobiņa to the new UPB industrial park in Liepāja where all production was located. Thus the production plants of glazed structures and windows in Riga and Daugavpils were shut down. Now Bērziņš recalls – this was a tough and difficult decision, since it affected people, who therefore became unemployed. However, if not shut down, the plants would put the whole holding at risk. "At that time we made a strategically correct and significant decision – to produce products of higher value-added, to invest and enter new export markets," he says now as the company has already exceeded the pre-crisis level. During the crisis construction nearly ceased in Latvia, and thus there was no demand for windows or glass constructions. However, at the same time Germany made huge investments in various infrastructure programmes – schools, hospitals, and other buildings of public significance. Contractors were commissioned through public procurement tenders. 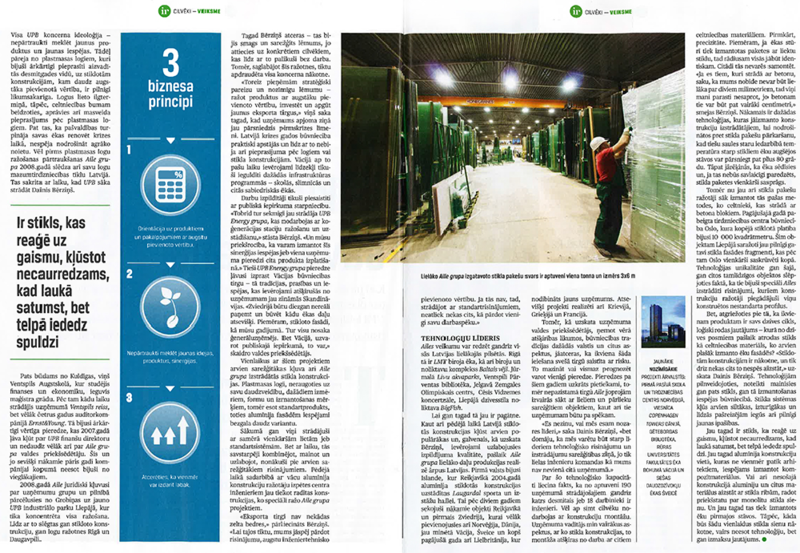 "At that time UPB Energy group was already successfully working there; this company was producing and installing cogeneration units," tells Bērziņš. "And our advantage was that we can make use of the synergy possibilities or the experience of one company in the distribution of another product." The experience of UPB Energy group allowed to understand the German construction market – traditions, requirements, and opportunities, which were completely different than the ones already common to the company working with Scandinavia. "In Sweden it would be rather unrealistic to construct only some part of a building. For instance, the glazed façade, as would be the case for us. Everything is there controlled by the general contractor. While in Germany, you can do that if you have been successful in a public procurement tender," explains the chairman of the board. Concomitantly with these projects the glass constructions designed by Aile group become more and more sophisticated. Despite of the variety of plastic windows – size, form, and purpose of use, the plastic windows are a standard product, whereas aluminium facades can have indefinite alternatives. However, initially they worked with rather simple things or the standard systems. But later on through combinations, alterations and improvements they achieved more and more sophisticated solutions. Recently in cooperation with the research centre engineers of a German aluminium construction producer constructions are developed, which are produced specially for Aile group projects. "Export markets are not a gold mine," tells Bērziņš confidently. "In order to enter these, we have to be able of selling a solution, high engineering added value. If you cannot do that, then working with standard solutions you can only sell your labour resources." Ailes performance is seen in nearly all largest cities of Latvia. In Riga it is the headquarters of LMT, and the office and warehouse centre Baltais vējš. In Jurmala it is the Līvu akvaparks, in Ventspils it is the Pārventa Library, in Jelgava – Zemgale Olympic Centre, in Cēsīs – Vidzeme Concert Hall, in Liepāja – the lifestyle warehouse BigFish. Although now it is history already. Even though glazed structures have gained popularity in Latvia, and what is more important – according to Bērziņš the performance quality has significantly improved, at present Aile group sells the majority of their products not in Latvia. First was Iceland, where the aluminium glazed structures were installed on the sports and trade fair hall Laugardal in Reykjavik. This was followed in two years by the next sites in Reykjavik and the first one in Sweden, soon after that followed by Norway, Denmark, the afore-mentioned Germany, Switzerland, and since last year – also United Kingdom, where a new company has been founded. Individual projects have been implemented in Russia, Greece, and France. However, the chairman of the board is of the opinion that considering the differences in law, the construction traditions in various countries, and other aspects, it should be remembered that entering a new market is a risky step. Risks can be reduced, or at least forecast only based on experience. Over the years experience has been gathered rather much, but in a market not yet known Aile avoids starting their business with large and too complex assignments, although the company would be capable of delivering these. "I do not know if were are leaders of the particular industry area," tells Dainis Bērziņš, "but I think we could be among the top companies in terms of engineering solutions and the complexity of solutions, since no other company has a team of engineers as big as ours." The engineering capacity is approved by the fact that out of nearly 190 employees of the company every tenth or 18 of them are engineers. Yet another nearly 100 employees are involved in the assembly of constructions. The manager of the company lists several aspects, where the glass constructions and the assembly thereof differs from the work with other construction materials. First of all, accuracy. For instance, where insulated shaped glass is used for edges, the radius thereof shall be identical everywhere. Or elsewhere it will not be possible to assemble it. "If I tell concrete producers that the deviation cannot exceed two millimetres, they usually do not understand me, since the deviation for concrete can be up to several centimetres," tells Bērziņš laughing. Next are various technologies, which shall be used by the developer of the structures in order to prevent over-heating of the insulated glass, where due to sun exposure the temperature between glass panes in the upper storeys can reach even plus 80 degrees. It shall also be taken into account that a building will be subject to depression, and where this is not considered, the insulated glass will break. However, the producers of insulated glass have started using the same methods which are used by construction workers working with concrete blocks. Last year the construction of a shopping centre in Oslo was completed, where the total glazed area was around 10 000 square meters. For this object ready-made glass façade fragments were produced in Liepāja, and later they were simply screwed together in Oslo. The unique about the technology in this and other similar objects lies in the fact that these were special solutions designed by Aile, and for these the producers of structures delivered non-standard profiles designed by them. Still, returning to the fact that each and every product has its individual life cycle it is only logical to ask – at which of the life cycles currently is glass as a construction material, considering it is commonly used for facades of buildings? "Glazed structures have future, and these will not be replaced by something else that soon," Dainis Bērziņš is of the opinion. As technologies improve the glass and the opportunities of its use in construction will definitely change. Glass systems will become warmer and warmer, durable, and among with the existing features will gain completely new features. Already now there is glass that reacts to light, where it turns not transparent, as soon as it is dark outside, and light is turned on inside. Already now instead of aluminium structures, which are not always preferred by architects, it is possible to use composite materials. Or – aluminium and other materials in the bearing structure can be replaced with glass ribs, thus creating the perception of a monolithic glass wall. And already now it is used in the ground storeys of buildings. Therefore the future of such one-piece glass walls depends not on the issue of technologies, but rather on costs thereof. 1. Focus on products and services with high value-added. 2. Constant search for new ideas, products, and synergies. 3. Keeping in mind you can always do better.